We took the time to round up everyone, why not take a few extra minutes to vary the settings and possibly the camera position when taking additional photos, so we don’t get stuck with just a single shot with somebody not looking their best? The only downside is that then everyone has their own opinion regarding which one they like the most, and few agree on the same shot. Such is life when taking family photos. Fortunately, cars don’t have opinions. Yet a similar thought process applies. In this instance, even if you have the camera on a tripod and you’re bracketing exposures resulting in 20 photos, they’re still all from the same vantage point unless you move the camera and tripod to another one. Even more liberating, if there is plenty of light, free the camera from the constraints of the tripod and shoot handheld from various heights and three-quarter angles. It’s important to remember that all car shapes are different, so an angle that works well for one may not seem as dazzling for another. That’s why we experiment when photographing features. The focal length of the lens can have a dramatic effect on how the car looks on its own and/or relative to its background. We’ve covered aspects of focal length in Hemmings Daily articles before, so here’s a very brief overview. Wide angles (short focal lengths up to about 28mm) make the car look like it’s reaching toward you and the background is pushed back. A 50mm lens is considered “normal” and is close to how your eyes perceive the car and background. Focal lengths from about 40mm to 70mm can also look fairly normal. Telephoto lenses (approximately 90mm and higher) compress the look of the car and the background appears to be closer to it. In this article, we’ll illustrate how changing the height of the camera (and photographer via a stepladder) relative to the subject car, and simply moving left or right alters the car’s appearance in its front three-quarter photos. 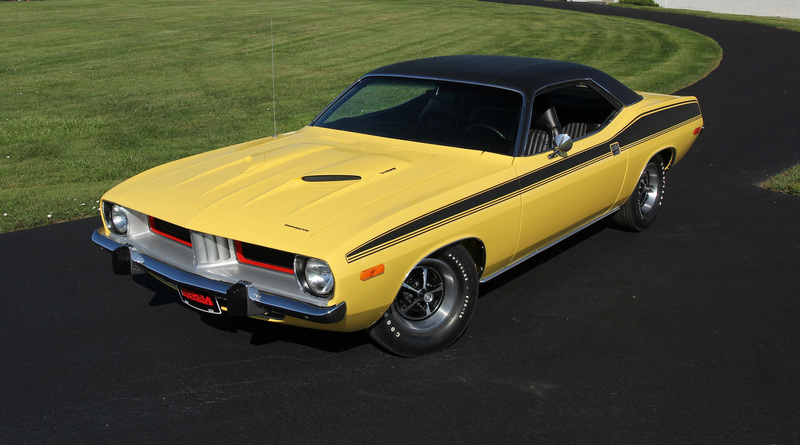 A simple blacktop-and-grass background was employed to photograph the stellar Lemon Twist 1973 ’Cuda owned by Mark and Susie Bailey. You can learn all about this Mopar in the restoration profile in the November 2018 issue of Hemmings Muscle Machines. A Canon 60D DSLR (with a 1.6:1 crop factor, see “Fun Ways to Improve Your Action Photos” for an explanation of the factor) with a Canon 17-40mm F4.0 L lens was used. Focal lengths varied between 36mm and 21mm. The photos were shot using apertures F8 and F11. All that said, you don’t need lots of equipment for replicating the shots shown here when photographing your car. An inexpensive camera or even a high-quality camera phone can likely do it, as the purpose of this article is not to have the highest pixel count, determine critical sharpness, or dial in the white balance to the nth degree. We are simply showing how the look of the car changes when you move the camera relative to it and possibly adjust the focal length a bit. Though the various views are not dramatically altered, the subtle differences are enough that opinions can be formed regarding which are more pleasing. 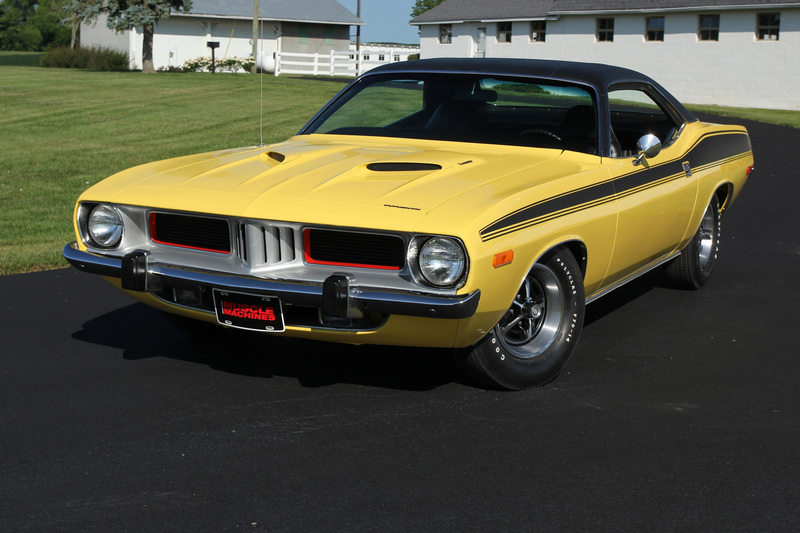 Take a look at these four front three-quarter photos of our subject ’Cuda and tell us which ones you prefer or don’t, and why. 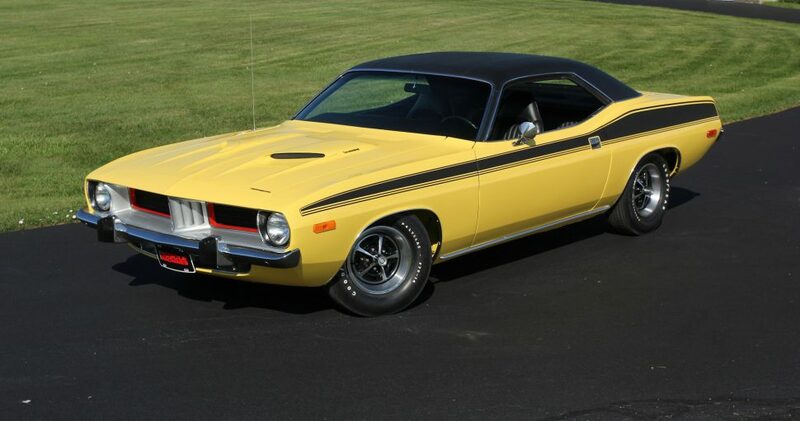 The next time you take pictures of your car, bring a small stepladder and see what effects the different camera positions have on how your vintage vehicle is depicted. The high shooting angle accentuates the shapes of the hood scoops and allows for a clean background with enough of the grass and the slope of the blacktop path included to enable cropping out a barn (exposure info: focal length 32mm, ISO 100, F-stop F11, shutter speed 1/100th sec., exposure bias +0.7 step). Eye-level is the traditional look that rings most familiar with many people. Here the grille area is emphasized a bit more than in the previous photo. Since this one was taken from eye-level, however, the barn can’t be cropped out resulting in a somewhat busy background (exposure info: focal length 34mm, ISO 100, F-stop F8, shutter speed 1/160th sec., exposure bias +0.3 step). Shot from the highest position on the stepladder, again, enough grass area above the ’Cuda was present to crop out the barn (exposure info: focal length 21mm, ISO 100, F-stop F8, shutter speed 1/200th sec., exposure bias +0.3 step). Notice how long car seems to be compared to the previous photos and how the grille area isn’t as prominent. 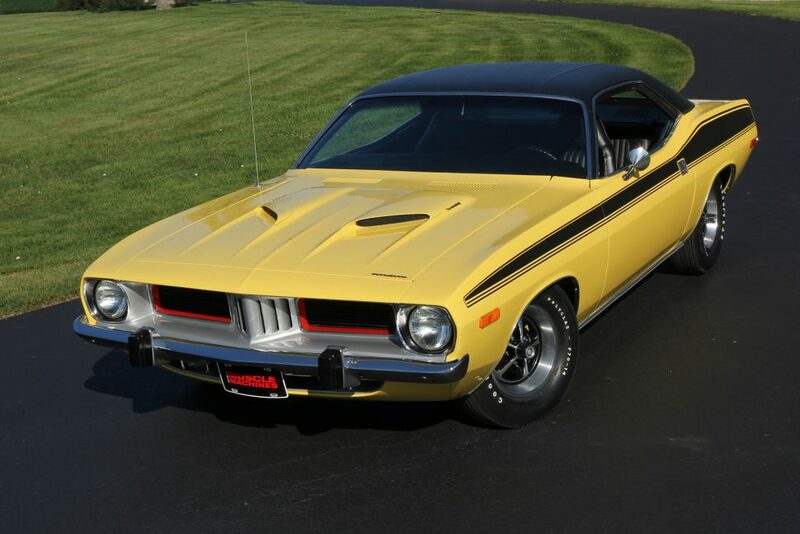 The changes in how the ’Cuda looks are due to the camera being repositioned to reveal more of the side of the car and raised to a higher angle, and the lens was set to a wider angle (shorter focal length).